Let's have a thread in which we discuss DOA6's graphics, including the look of characters, their costumes, stages etc. New high polygon hair meshes, especially the pigtails, new ear shape, higher quality textures and shaders allround. Improved hair and ribbon meshes, better texturing and shaders, and while I'm always very careful to claim facial changes have been made, because different lighting and shading can easily play tricks on you, I think Marie's chin is less round and her lower lip has less volume. Marie looks a bit less baby-faced and pouty. I already knew T7 looked bad but damn... I've never put any image side to side with DOA or any other fighting game, and now that I'm seeing this I think I just peed my pants from laughing. Yeah, I told people Tekken 7 looks ugly the day it was first revealed, many of its characters models don't even reach the quality of DOA5's. I saw people honestly claim the PS4 wasn't powerful enough, lol. I think the only one who needs some work is Hayate. I honestly like his old face more... but Bayman and Rig? OOF! CAN'T WAIT FOR MORE COSTUMES FOR THEM. How do you guys find the more pronounced chin stuble they gave him? This by the way reminds me how you do scars right. Rig as a couple of them giving him that rugged, weathered look. Diego's fat, criss cross anime scars however look ridiculous and are way overdesigned. Hmm seeing that comparison, I now can see the similarities are there. Yeah, it’s basically the same. Just the lighting makes it worth it. However, there’s still something that makes him look kinda different compared to 5... I don’t know what is. Probably the fact that he actually looks older now thanks to having more noticeable bump maps like you said lol. That and his hair, I’m sorry but Hayate’s highlights are just... ugh. Not for me lol. Cool this will be a good place to talk about The graphics and look of the characters. Especially as stuff like the deluxe outfits start to get shown and stuff like the final character reveals before launch. ( placing my bets on Eliot and Brad here. )Oh and stages too, Liking the look of the stages revealed so far but If I had to pick a favourite it would be the Japanese forest stage. Yeah, personally I like Diego's scars but I will say that there's a truth to the saying "less is more", Rigs scars have a lot more subtlety to them than Diego's that's for sure. Oh and for me I'm a fan of the more pronounced stuble. ...I think they gave them kinda weird bodies. :/ And I am not just talking about the missing navels thing, lol. They slimmed the male characters considerably down, they gave them really weirdly shaped biceps and the pectorals look also weird and square. While the old bodies were very low polygon and poorly textured and shadered, I think their shape was nicer and more natural in comparison to DOA6. And, yeah, there is the navel thing after all. I shed a tear when I saw your post of DOA5 models with actual visible navels, lol. Imo personally think DOA6 is the best looking fighting game that will be out atm, unlike DOA5LR where the only major changes were particle effects and a slapped on skin shader, DOA6 is using more current lighting techniques and such which DOA5 didn't do. Outfit textures and facial expressions also look better too and even the hair looks improved, even tho it seems like they still are using the super thin look for loose hair since it can go over the shoulders, but it does look crisper so I guess that's an improvement. By the way, when I first saw Ayane's classic costume I thought that they ripped it straight out of DOA5 without any improvements. I was wrong about that. Yesterday I compared the two costumes directly and they did actually improve the model. The big bow has way more polygons now, it was actually quite blocky before, the chest is modelled rounder and the textures of the costume have also changed and improved. So, they actually do also polish the old DOA5 costumes. Oh that's cool to see then that the outfits that are being brought back are being improved on, I was hoping they would be so It's nice to know that returning outfits will be seeing advantages from doa6. Also the close up comparison shots are always appreciated, It's cool to see clearly what's been improved. rig's stubble looks VERY high res, as do the new seams on ayane's dress. i'm hoping they continue to add small things like that here and there. and yeah the male's bodies are shaped a little oddly. the lack of width on the shoulders and back looks weird in comparison to doa5, especially on bayman who i considered one of the biggest characters alongside bass. Look at that dirt on the dress and gloves. It looks like they threw some glue to it and then Kasumi got into a sand fight and some of the sand got stuck in the glue. Idk... its SO noticeable. 5 also had some textures that looked fake or ugly (like the snow ones omfg I HATE THEM) but overall I think the dirt feature looked good. 6 in comparison... ugh. Not much, at least in this dress. And I know there’s gonna be people who says “omg its just dirt and its ugly anyway turn it off”, but I actually LOVE the dirt/wet feature and I remember being in awe back when 5 came and I saw the characters sweating and getting some dirtiness in their clothes as they fighted because it made the characters feel actually alive and that the fight progressed, since they actually sweat and gets their clothes dirty. This was such a huge step in detail especially after the huge style revamp the franchise got, that went from anime looking to realistic. This actually added the perfect touch to make them more “real”. While the cloth indeed moves unnatural and like thick rubber mats, they actually do showcase some form of physics now, like momentum when swinging around, something DOA5 completely lacked. I also don't think the cloth moved particularly nice in DOA5. DOA4 actually had way nicer nicer movement. Remember how beautifully smooth Kokoro's kimono moved, or Helena's greek goddes dress, or Leifang's cheongsam? Good eye there, I didn't notice that before. That is a shame. :/ What improvement I did notice though, hair parts, like bangs for example, now actually move during movement and in the wind, that was not always the case in DOA5. Yeah, I am with you on this one, I also noticed how bad the stains look and decided for myself immediately: Yep, I'll turn this off first thing. I have nothing against dirt, sweat or blood effects, but they need to be good looking and convincing. 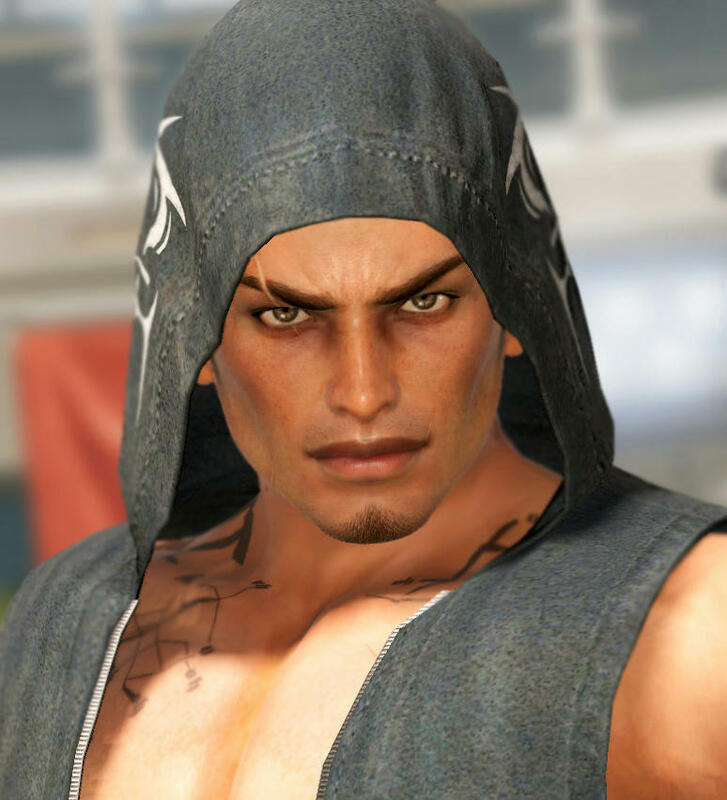 I turned the DOA5 dirt effects off because they looked so low resolution and made the character models look ugly, but they looked more natural in color and placement than DOA6. When DOA5 newly released it had way better sweat effects than this. There were even little glissening droplets of sweat/water on the bodies. 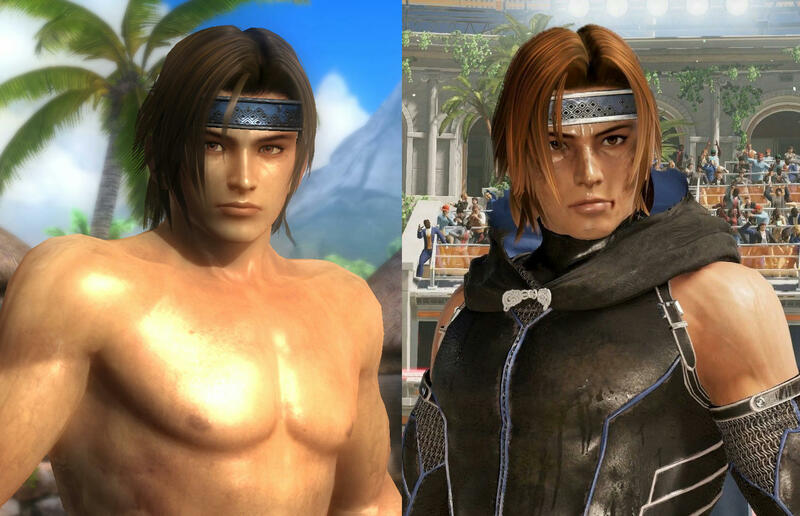 They downgraded that sweat effect over the years in DOA5U and DOA5LR and each new costume set. In the end sweat looked like thick, clear jelly (not to reference a bodily fluid of similar consistency *coughs*) running down the characters' bodies. little droplets were completely gone. In a recent interview Shimbori stated they are going to improve the sweat effect and they really need to. This doesn't look good. As a whole, this game is looking CLEAN. Every other 3D fighting game honestly cannot compare right now, especially when you consider the art style, modeling, etc. The characters look really well-done in general. The hair looks amazing in most places (shadows underneath bangs and better bang movement too! ), so there is like no room to complain for anything besides hair physics and overall hair length since DOA has THE BEST hair in fighting games because it actually looks like hair unlike Bamco’s N64 quality and Capcom’s claymation clipfest. Also everyone has really gotten a better and more unique face this time around. Anyone who thought 5 had sameface syndrome (which it really didn’t) cannot say the same for 6 at all. Same thing happens in The Muscle too. I know a little dirt is normal but Jesus! It seems like every stage has people getting extremely dirty, like overkill levels. And like what Ninoasker said, the dirt looks really unrefined. I would like to see different dirt colors and types too like mud getting smeared on clothes and faces instead of the tan dirt we have been seeing so far buuut the game is unfinished so hey! Another thing to mention is that there’s like very little anti-aliasing either. Those new thin glasses are KILLING me! It’s not that big of a deal but I would like to see that get smoothed out eventually. DOA5 Vanilla suffered from the same problems too so maybe not though? I don’t really like how the sixth Dead or Alive tournament is seemingly sponsored by Vaseline either. Everyone looks so oily and sweaty even before the match starts, like in that pic of Ayane in the white dress. It happens a lot in Lost Paradise too. Is that a bug or something??? Regardless, it looks better than Tekken a Nap’s sweaty PVC-action-figure aesthetic. Everyone always looks shiny there, yuck! Speaking of which is it me or did they completely scrap the sweat beads in the win poses? I see sweat fall off the chins but no actual beads of sweat running down the characters’ faces. Say what you want but DOA5 was ahead of the game with that in 2012; no other action game has ever added that detail so I would be sad to see it go. I will also miss when clothes got wet and you could see the girl’s bras. I want more see through stuff lol!! Side note, I really wish TN would release some in-progress gameplay clips to keep hype going and to show how things are improving. I hate waiting a month in between little bits and pieces of trailers and sparse camera footage from Japanese events to get a look at how the game’s evolving. Maybe a glimpse of the already-completed wrestling outfits or something?? Idk but I’m really curious to see what TN has fixed or added because every new build looks better than the last (duh it’s supposed to!). DOA has THE BEST hair in fighting games because it actually looks like hair unlike Bamco’s N64 quality and Capcom’s claymation clipfest. Also everyone has really gotten a better and more unique face this time around. Anyone who thought 5 had sameface syndrome (which it really didn’t) cannot say the same for 6 at all. Lacking antialiasing seems to be a Koei Tecmo thing. All their recent games lack it, at least on consoles. DOA5LR did lack it too. 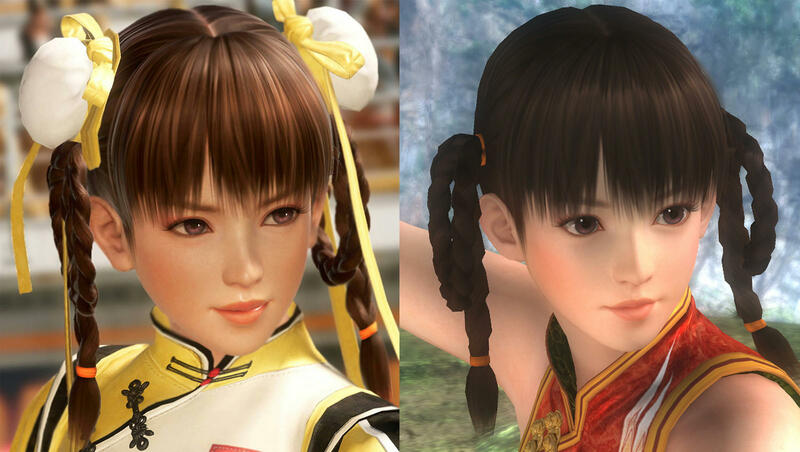 Aliasing wasn't as severe looking as in DOA5 simply because they bumped up the resolution from 720p to full HD. That does help a little. I actually doubt they will implement it in DOA6. The only option to circumvent that will be playing it in 4K on PC downsampled. I guess the Xbox One X and PS4 Pro will reach resolutions of around 1800p and 1440p respectively, that will also help alleviate the problem. Agreed here as well. This is something that is really starting to bother me. We basically just get official trailers once a month or poorly recorded streams or off-screen footage of the game to see. Even the official trailers are badly compressed. Sites like Gamersyde, which usually are able to provide the highest quality footage they get from a game/developer's marketing department, never get any high quality footage from Koei Tecmo. Just like their Youtube videos everything's badly compressed, finer details impossible to make out. What gives? i feel like this time around they really need to separate what happens when a character gets sweaty vs. when they get drenched in water. skin wise, sweat needs to have a couple 'lines' with beads that you spot around the body, and the shininess increasing just the slightest bit. DOA5 had a nice middle-ground where the sweat and water effects could apply well to either situation, (most of the time) while here it looks like he's completely dry except for the fact that someone dumped a bottle of water on his chest. I will also miss when clothes got wet and you could see the girl’s bras. I want more see through stuff lol!! that was one of the coolest things that really impressed me with the DOA5 demo. i knew from that moment on no one would touch doa graphically. also i'm pretty sure we saw kasumi's white socks getting wet though so maybe it's still staying !